Mr. Loadlink reflects on the recent sale of Straightpoint to The Crosby Group. It was the biggest—and hardest—decision of my life. 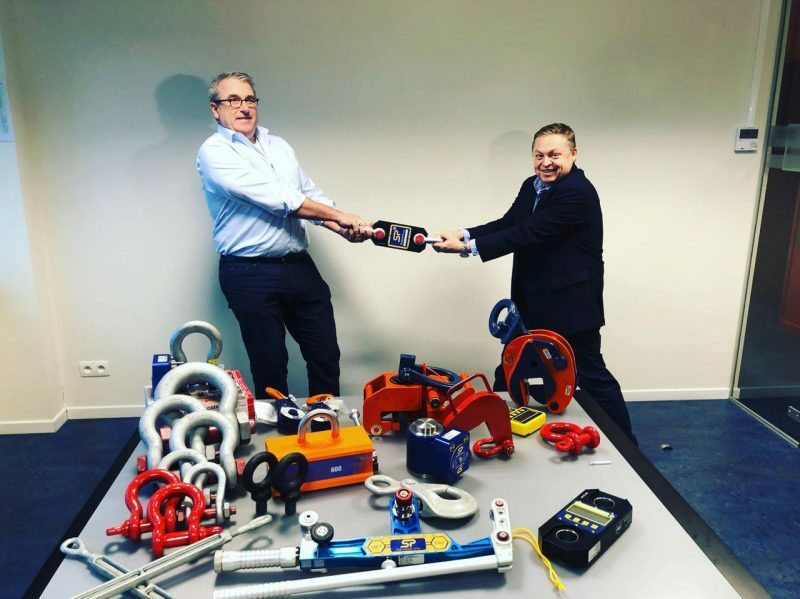 On 2 January 2019 news broke that Straightpoint (SP) had been sold to The Crosby Group, the largest lifting, rigging, and material handling hardware company on planet earth. I reeled, myself, even though, as an owner, I’d been involved in discussions from the outset. It felt so real all of a sudden. My next conversations would be with people who’d bought into my vision for the future and aligned their own goals, and the welfare of their families, with my own. I’d encouraged some of them to leave companies where they’d worked for 10, 20, or more years to join me on my mission. Now I had to explain that I’d sold it. Their fate (including that of my son, Isaac, who is an apprentice at the business) was in someone else’s hands. But that’s why I did it. I’ll explain. SP wasn’t ‘for sale’. I’ll be honest, I’d spoken to the board about taking more of a backseat role when I turned 50 years old (I’ve got a couple of years to go, by the way! ), but even that wasn’t set in stone. And we’d had purchasing interest before. I understood why; we’re a highly systemised, technologically advanced, gazelle company, with a brand new in-house machine shop. Further, our marketing and reputation is as good, if not better than, anyone else, and we have a tremendous dealer network that puts our products to market in sectors that are more readily consuming such technologies than ever before. The team is the envy of competitors and the future is shining bright. Nevertheless, prospective buyers were easy to turn away; it didn’t matter how much money they waved. In fact, any talk of value turned me off straight away. What would they know about our worth? SP has been a huge part of my life since April 15 2002 when I too saw its potential. It’s governed my thoughts, kept me up at night, delivered extremes of emotion I didn’t know were possible, and afforded me relationships I’ll treasure for eternity. I’ve travelled the world over and over again, championing the products, recruiting the best in the business, and rolled the dice on many occasions. I don’t want sympathy, appreciation, or even recognition—it’s been the most thrilling, uplifting journey I could have wished for—I’m just explaining why I didn’t want to sell it. Imagine your favourite car, best holiday, dream house, first romance, neighbourhood, friends, career… all in a box. That’s what SP was (and still is) to me. Then Crosby came along. Actually, more specifically, it was a representative of the company’s Belgium operation, who was walking down the aisle at a trade show. I’d had dialogue with many members of the Crosby family before (and liked them all) but this conversation felt like a significant point in time. At that moment, I couldn’t tell why. And I don’t think the guy from Crosby knew either. Maybe you had to be there to know what I mean. We spoke about the compatibility of our respective equipment ranges—SP load shackles are based on the industry standard Crosby G2130 shackle, and our products are used on its rigging trucks. The two businesses, so different in size, felt like kindred spirits, we agreed. It’s been a pleasure, and a learning experience, to work closely with Crosby’s Robert Desel in recent months. That conversation was referenced later, by which point discussions about a possible acquisition had gone way beyond where they had with other interested parties. It never felt like a negotiation. In fact, it wasn’t one. Crosby wanted to buy us; our position as a leader and innovator in load measurement and monitoring, and the opportunity to integrate that technology into an already strong portfolio, was a compelling option. On the other hand, the more I put myself in the shoes of our apprentices, engineers, sales team, distributors, etc., the greater the appeal of the acquisition. I could see the glass ceiling shattering. Crosby is a behemoth. There was a bigger picture to acknowledge beyond the SP we’d created. Accountants, lawyers, engineers, and flamenco dancers (ok, scrap the last one); they all had to pore over something and everyone had questions on top of their queries after their requests. It required incredible patience, thoroughness, and a respect for detail. Our quality management systems are exemplary; we’re ISO’d, accredited, and certificated up to our eyeballs, but it still took us a seemingly endless amount of time to complete the task. I’m indebted to everyone who helped provide information about things, often without being given cause or reason, and to Peter McGreal, my business partner, for spending many an evening and weekend buried under a mountain of paper. Fortunately, negotiations never went like this! I was on a fact-finding mission of my own throughout the process. I’ve been around Crosby representatives a lot over the years but as a deal between our companies became more likely, I tried to read its employees more closely. I asked myself questions: Are they professional? Are they personable? Are they happy? Do they feel well supported? Has their career progressed? What training is made available to them? Do they speak fondly about the company? Are they the sort of person I can imagine my team working for or with? I couldn’t directly address these matters but it was possible to get a sense for the answers during discussions. Another box was ticked. I couldn’t find a bad one in the bunch. It was a DNA match all round. I’d be lying if I said I didn’t have doubts, or even reconsider the prospect altogether, but every time I boiled it down to the SP family, it was always the right thing to do by them to sell to Crosby. Of course I acknowledge that my own circumstances were considered. I’m no saint. The timing was right there too. Crosby mightn’t have knocked again and if they hadn’t who else could match them as owners? What was I waiting for? The world feels unsettled politically and economically, especially here in the throes of Brexit, but Crosby buying SP was the more sensical thing I’ve pondered for a long time. I’m struggling to think of a loser out of it—other than our competitors. Eventually I was there with pen in hand. Shaking but steadfast at the same time. Done. A new chapter opened. Since then it’s been pedal to the metal integrating the business into the Crosby machine. 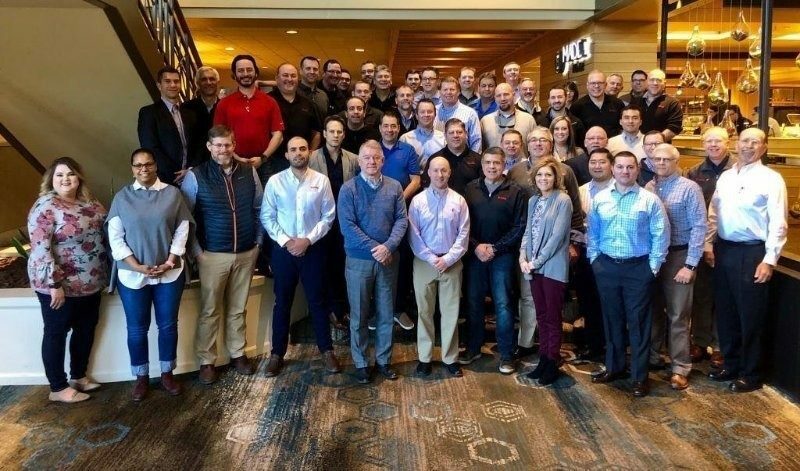 Once I’d answered questions from staff at SP here at Hampshire HQ, I was off to Tulsa, Oklahoma, where our new owners had assembled the sales team and other personnel for a week of intensive product training on the SP range. Next stop, Belgium. Same again. What great people, I thought. Relief! Can you find me amongst Team Crosby? As I start life as global business development director for load monitoring solutions at SP—and get used to having a boss for the first time in a while—much remains the same. When I sat down with my new employers to discuss my role moving forward, the plan was based on playing to my strengths. I spoke fondly of the people, product development, trade shows, and marketing, for example. So expect to see me at the same events, talking with equal passion about the products that have changed my life. Crosby didn’t buy SP to change it, but to improve it. I echo the sentiments of Robert Desel, chief commercial officer there: the acquisition is focused on growth. 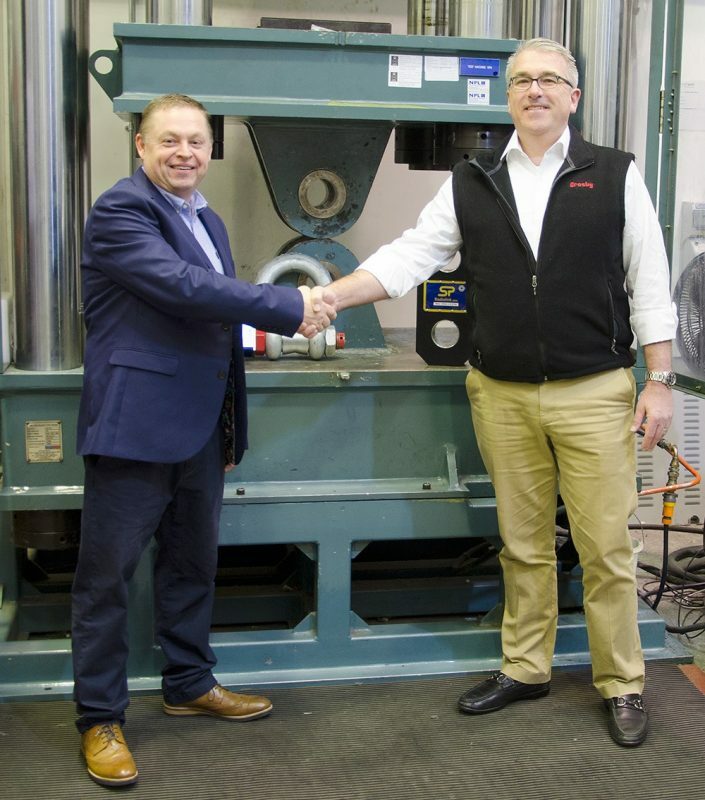 SP already represented a force in the marketplace and as part of Crosby we can position our products and expertise closer to the point of use and increase the pace of innovation. That last point is worth reiterating. The speed at which we will now be able to develop product and innovate will be unrivalled by anyone in the relevant space. Our first big product-themed announcement of the year is imminent, and there’ll be plenty more to follow. Thank you to everyone who has taken the time to email, call, or message me on social media. I’ve been truly overwhelmed and humbled by the congratulations and support. As another trade show season dawns, I look forward to seeing my old friends, and making new ones. I’m still Mr. Loadlink. Isaac is still Mr. Loadlink Jr. SP is still SP. Only better.